Vidyarambham is an important Hindu tradition that is observed on the ‘Vijayadashami’ day during the Malayalam month of ‘Kanni’. This ceremony is also known as ‘Ezhuthiniruthu’ in the southern states of India like Karnataka and Kerala. In this ritual young children aged between 3-5 years are introduced to the world of knowledge, music, dance and some forms of folk arts. The observance of Vidyarambham marks the final and tenth day of the Navratri celebrations and is considered to be an auspicious day for initiating the learning process, especially in young children. This ceremony is performed in temples and even few households. The process of initiation and learning is closely linked to the ‘Ayudha Puja’ ritual. According to the beliefs, it is on the day of Vidyarambham that Goddess Saraswati, the Hindu Goddess of knowledge and wisdom, and Gurus or teachers should be presented with ‘Gurudakshina’ as a token for Thanksgiving. Vidyarambham ceremony is very renowned in the ‘Thunchan Parambu Temple’ in Kerala and ‘Kollur Mookambika Temple’ in Karnataka. Children get up early and after a bath dress up in traditional clothes. On the day of Vidyarambham devotees worship Lord Vishnu, Goddess Saraswati and Lord Ganesha. Initially Lord Ganesha is invocated for an auspicious beginning of the learning process. In the Vidyarambham ceremony, children first write the mantra ‘Om Hari Sri Ganapataye Namah’ by tracing it on sand or in a tray filled with rice grains. This ritual is conducted under the supervision of a guru or a priest. After this, the Guru writes the same mantra on the tongue of the child with gold. These practices during Vidyarambham hold a special significance. Writing on sand signifies practice; writing on rice grains symbolizes acquisition of knowledge that leads to prosperity. Lastly writing with gold on child’s tongue invokes the grace of Goddess Saraswati, which is essential for acquiring true knowledge. After the completion of the ceremony, stationery items like slates and pencils are distributed to other children by the child who performed the Vidyarambham rituals. 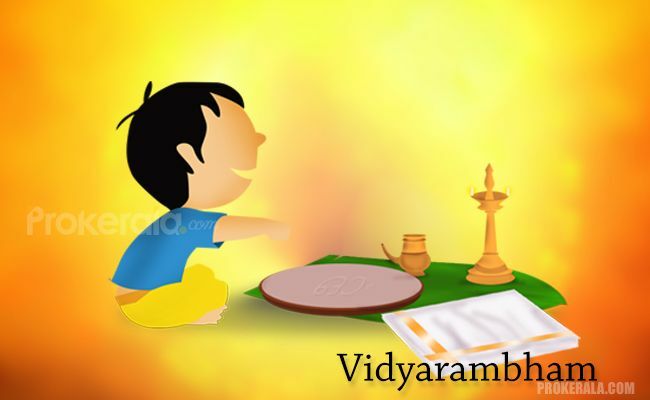 Vidyarambham is a significant ritual meant for children. In Malayalam, ‘vidya’ means ‘knowledge’ and ‘arambham’ implies ‘a new beginning’. Special preparations are made for this ceremony in the temples of Kerala and Karnataka. Thousands of devotees visit the temples on the Vidyarambham day to introduce their children to the world of learning. This ceremony is followed by people of caste and religion and is observed with full fervour and enthusiasm, all across southern India.